Daytona Beach, Fla. – The first race is often the hardest for a newly formed team. For Action Express Racing, the first race was also the most difficult on the Grand-Am schedule. But in one of the biggest upsets in Rolex 24 at Daytona history, the new team won the battle versus vaunted Chip Ganassi Racing in a late-race showdown. 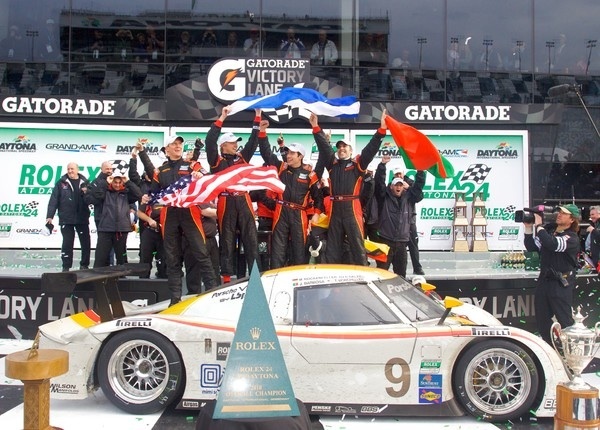 “With all the obstacles (of a new team), it’s unrealistic to expect to win,” said Terry Borcheller, who co-drove a Riley-Porsche to the victory with Joao Barbosa, Ryan Dalziel and Mike Rockenfeller in a race that started in the rain and ended with a record distance for the Daytona Prototypes. It seemed as if an uncanny destiny was on the side of Action Express drivers, who were powered by a privately developed Porsche V-8. The race turned on a pit stop by Ganassi’s Justin Wilson in the 22nd hour for what turned out to be a phantom problem. That put the almost flawless Action Express team into the lead for good after an eight-hour duel with Ganassi. Wilson had heard what sounded like “an explosion” as he exited the chicane with Rockenfeller in pursuit. “It was a split second decision,” said Wilson, who was directed into the garage by his crew before quickly returning to track after the car was examined. Wilson later decided that a chunk of spent tire probably hit the underside of his car. That left him and co-drivers Scott Pruett, Memo Rojas and Max Papis too far behind to catch up. Action Express won this time on its consistency as well as the installation of a new spring on the throttle in the closing stages on the pit road. “I don’t think anybody expected to see this car leading the race,” said Dalziel of the effort also slowed by a broken clutch pedal. The team’s V-8 engines, which have been developed by the Texas-based Lozano Brothers from Cayenne SUV engines, never missed a beat. When Brumos elected to reduce its team to one car and open a second team under the same roof of the shops of longtime technical director Mike Colucci in Denver, N.C., it began developing a Riley chassis with the Porsche V-8. Bob Snodgrass, the late owner of the Brumos team, was the one who initiated the V-8 program, despite the fact Porsche declined his proposal to make it a factory project. The decision to split the team and add longtime Snodgrass friend Bob Johnson as the owner of the Action Express entry was made due to budget considerations and the fact the Porsche factory was not in favor of the V-8 engine officially representing its racing effort. Brumos has been the face of Porsche’s official factory racing in America since team founder Peter Gregg and Hurley Haywood won the Daytona 24-hour in 1973. The No. 59 Brumos entry, the defending race winners, contested the lead in the night, but its factory-built flat six eventually blew up. That ended the last professional race for endurance racing legend Haywood shortly after his final stint Sunday morning. After turning down the request to develop the V-8 under the factory budget, Porsche’s racing department at Weissach nevertheless built the first of the Cayenne-based V-8’s that initially powered the Spirit of Daytona team’s Fabcar in 2007 and 2008. The Spirit of Daytona’s Coyote-Porsche, the only other entry running the Porsche V-8 versus the Chevy, Ford and BMW engines, retired from this year’s race just before the halfway mark. In the GT category, the SpeedSource Mazda RX-8 driven by Sylvain Tremblay, Nick Ham, Jonathan Bomarito and David Haskell came from seven laps down after a collision with a prototype sent it to the garage before the halfway mark. Although the steering was affected, no repairs were made and the RX-8 returned to the fray. In this case, it didn’t hurt the team’s chances of victory. Three of the TRG Motorsports Porsches led during the race as well as the Stevenson Motorsports Camaro GT.R., but all fell prey to problems later in the race, enabling SpeedSource to catch up. That included running out of fuel in the case of the No. 71 Porsche driven by Bobby Labonte, who had to navigate the infield to get back to his pits.